For botanical usage, see Berry (botany). For other uses, see Berry (disambiguation). A berry is a small, pulpy, and often edible fruit. Typically, berries are juicy, rounded, brightly colored, sweet or sour, and do not have a stone or pit, although many pips or seeds may be present. Common examples are strawberries, raspberries, blueberries, blackberries, red currants, white currants and blackcurrants. In Britain, soft fruit is a horticultural term for such fruits. Berries have been valuable as a food source for humans since before the start of agriculture, and remain among the primary food sources of other primates. They were a seasonal staple for early hunter-gatherers for thousands of years, and wild berry gathering remains a popular activity in Europe and North America today. In time, humans learned to store berries so that they could be used in the winter. They may be made into fruit preserves, and among Native Americans, mixed with meat and fats as pemmican. Berries also began to be cultivated in Europe and other countries. Some species of blackberries and raspberries of the genus Rubus have been cultivated since the 17th century, while smooth-skinned blueberries and cranberries of the genus Vaccinium have been cultivated in the United States for over a century. In Japan, between the 10th and 18th centuries, the term ichibigo ichigo referred to many berry crops. The most widely cultivated berry of modern times, however, is the strawberry, which is produced globally at twice the amount of all other berry crops combined. The strawberry was mentioned by ancient Romans, who thought it had medicinal properties, but it was then not a staple of agriculture. Woodland strawberries began to be grown in French gardens in the 14th century. The musky-flavored strawberry (F. moschata) began to be grown in European gardens in the late 16th century. Later, the Virginia strawberry was grown in Europe and the United States.[when?] The most commonly consumed strawberry, the garden strawberry (F. ananassa), is an accidental hybrid of the Virginia strawberry and a Chilean variety Fragaria chiloensis. It was first noted by a French gardener around the mid 18th century that, when F. moschata and F. virginiana were planted in between rows of F. chiloensis, the Chilean strawberry would bear abundant and unusually large fruits. Soon after, Antoine Nicolas Duchesne began to study the breeding of strawberries and made several discoveries crucial to the science of plant breeding, such as the sexual reproduction of strawberry. Later, in the early 1800s, English breeders of strawberry made varieties of F. ananassa which were important in strawberry breeding in Europe, and hundreds of cultivars have since been produced through the breeding of strawberries. A form of the word "berry" is found in all the Germanic languages; for example, Old English berie compares with Old Saxon and Old High German beri, and Old Norse ber. These forms point to the Proto Germanic *bazją. In Old English, the word was mainly applied to grapes, but has since grown to its current definition. In botanical terminology, a berry is a simple fruit with seeds and pulp produced from the ovary of a single flower. It is fleshy throughout, except for the seeds. It does not have a special "line of weakness" along which it splits to release the seeds when ripe (i.e. it is indehiscent). A berry may develop from an ovary with one or more carpels (the female reproductive structures of a flower). The seeds are usually embedded in the fleshy interior of the ovary, but there are some non-fleshy examples such as peppers, with air rather than pulp around their seeds. The differences between the everyday and botanical uses of "berry" results in three categories: those fruits that are berries under both definitions; those fruits that are botanical berries but not commonly known as berries; and those parts of plants commonly known as berries that are not botanical berries, and may not even be fruits. Berries under both definitions include blueberries, cranberries, lingonberries, and the fruits of many other members of the heather family, as well as gooseberries, goji berries and elderberries. The fruits of some "currants" (Ribes species), such as blackcurrants, red currants and white currants, are botanical berries, and are treated as horticultural berries (or as soft fruit in the UK), even though their most commonly used names do not include the word "berry". Botanical berries not commonly known as berries include bananas, tomatoes, grapes, eggplants (aubergines), persimmons, watermelons, and pumpkins. There are several different kinds of fruits which are commonly called berries, but are not botanical berries. Blackberries, raspberries, and strawberries are kinds of aggregate fruit; they contain seeds from different ovaries of a single flower. In aggregate fruits like blackberries, the individual "fruitlets" making up the fruit can be clearly seen. The fruits of blackthorn may be called "sloe berries", but botanically are small stone fruits or drupes, like plums or apricots. Junipers and yews are commonly said to have berries, but these differ from botanical berries and are instead highly modified seed-bearing cones. In juniper berries, used to flavour gin, the cone scales, which are hard and woody in most conifers, are instead soft and fleshy when ripe. The bright red berries of yews consist of a fleshy outgrowth (aril) almost enclosing the poisonous seed. Strawberries have been grown in gardens in Europe since the 14th century. Blueberries were domesticated starting in 1911, with the first commercial crop in 1916. Huckleberries of all varieties are not fully domesticated, but domestication was attempted from 1994–2010 for the economically significant western huckleberry. Many other varieties of Vaccinium are likewise not domesticated, with some being of commercial importance. Many soft fruit berries require a period of temperatures between 0 °C and 10 °C for breaking dormancy. In general, strawberries require 200–300 hours, blueberries 650–850 hours, blackberries 700 hours, raspberries 800–1700 hours, currants and gooseberries 800–1500 hours, and cranberries 2000 hours. However, too low a temperature will kill the crops: blueberries do not tolerate temperatures below −29 °C, raspberries, depending on variety, may tolerate as low as −31 °C, and blackberries are injured below −20 °C. Spring frosts are, however, much more damaging to berry crops than low winter temperatures. Sites with moderate slopes (3–5%), facing north or east, in the northern hemisphere, near large bodies of water, which regulate spring temperature, are considered ideal in preventing spring frost injury to the new leaves and flowers. All berry crops have shallow root systems. Many land-grant university extension offices suggest that strawberries should not be planted more than five years on the same site, due to the danger of black root rot (though many other illnesses go by the same name), which is controlled in major commercial production by annual methyl bromide fumigation. Besides the number of years in production, soil compaction, the frequency of fumigation, and herbicide usages increase the appearance of black root rot in strawberries. Raspberries, blackberries, strawberries, and many other berries are susceptible to verticillium wilt. Blueberries and cranberries grow poorly if the clay or silt content of the soil is more than 20%, while most other berries tolerate a wide range of soil types. For most berry crops, the ideal soil is well drained sandy loam, with a pH of 6.2–6.8 and a moderate to high organic content; however, blueberries have an ideal pH of 4.2–4.8 and can be grown on muck soils, while blueberries and cranberries prefer poorer soils with lower cation exchange, lower calcium, and lower levels of phosphorus. Growing most berries organically requires the use of proper crop rotation, the right mix of cover crops, and the cultivation of the correct beneficial microorganisms in the soil. As blueberries and cranberries thrive in soils that are not hospitable to most other plants, and conventional fertilizers are toxic to them, the primary concern when growing them organically is bird management. Post-harvest small fruit berries are generally stored at 90–95% relative humidity and 0 °C. Cranberries, however, are frost sensitive, and should be stored at 3 C. Blueberries are the only berries that respond to ethylene, but flavor does not improve after harvest, so they require the same treatment as other berries. Removal of ethylene may reduce disease and spoilage in all berries. Precooling within one to two hours post-harvest to storage temperature, generally 0 °C, via forced air cooling increases the storage life of berries by about a third. Under optimum storage conditions, raspberries and blackberries last for two to five days, strawberries 7–10 days, blueberries two to four weeks, and cranberries two to four months. Berries can be shipped under high carbon dioxide or modified atmosphere of 10–15% carbon dioxide for high carbon dioxide or 15–20% carbon dioxide and 5–10% oxygen for a modified atmosphere container to increase shelf life and prevent grey mold rot. Brambles have been cultivated for thousands of years and been crossed back and forth to create the range of edible Rubus which we have today. Several discoveries in the science of breeding berries were made in the 18th century by Antoine Nicolas Duchesne in his work on strawberries. 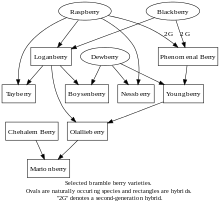 In the traditional technique of plant breeding, berries with specific desirable characteristics were chosen and allowed to sexually reproduce with other berries, and offspring with improved traits could then be selected and used for further crossing. Plants may be hybridized with different species within the same genus; hybridization between different genus may also be possible, but more difficult. Breeding may seek to increase the size and yield of the fruit, improve the flavor and quality of its nutrient content, such as antioxidants, expand the harvest season, and produce cultivars with resistance to diseases, tolerance of hot or cold conditions, and other desirable traits. Advancements in molecular biology and genetic engineering allow for a more efficient and better targeted approach in the selection for a desirable genotype, via marker-assisted selection, for example. Genetic modification techniques can also be used for breeding berries. Some fruit not commonly referred to as berries and not always botanically berries are included by land-grant university extension offices in their guides for berry cultivation, or in guides for identifying local wild edible and non-edible berries. Examples include beach plums, American persimmons, pawpaws, Pacific crabapples, and prickly pears. In certain regions, berrypicking can be a large part of the economy, and it is becoming increasingly common for western European countries such as Sweden and Finland to import cheap labor from Thailand or Bulgaria to do the berry picking. This practice has come under scrutiny in the past years because of the low wages and poor living standard for the "berry-pickers", as well as the lack of worker safety. Once ripened, berries are typically of a contrasting color to their background (often of green leaves), making them visible and attractive to frugivorous animals and birds. This assists the wide dispersal of the plants' seeds. Berry colors are due to natural plant pigments, such as anthocyanins, together with other flavonoids localized mainly in berry skins, seeds and leaves. Although berry pigments have antioxidant properties in vitro, there is insufficient physiological evidence established to date that berry pigments have actual antioxidant or any other functions within the human body. Consequently, it is not permitted to claim that foods containing polyphenols have antioxidant health value on product labels in the United States or Europe. Berries are commonly used in pies or tarts, such as grape pie, blueberry pie, blackberry pie, and strawberry pie. Berries are often used in baking, such as blueberry muffins, blackberry muffins, berry cobblers, berry crisps, berry cakes, berry buckles, berry crumb cakes, berry tea cakes, and berry cookies. Berries are commonly incorporated whole into the batter for baking, and care is often taken so as to not burst the berries. Frozen or dried berries may be preferable for some baked berry products. Fresh berries are also often incorporated into baked berry desserts, sometimes with cream, either as a filling to the dessert or as a topping. Berries are often added to water and/or juiced, as in cranberry juice, which accounts for 95% of cranberry crop usage, blueberry juice, raspberry juice, goji berry juice, acai juice, aronia berry juice, and strawberry juice. Wine is the principal fermented beverage made from berries (grapes). Fruit wines are commonly made out of other berries. In most cases, sugars must be added to the berry juices in the process of Chaptalization to increase the alcohol content of the wine. Examples of fruit wines made from berries include: elderberry wine, strawberry wine, blueberry wine, blackberry wine, redcurrant wine, huckleberry wine, goji wine and cranberry wine. Berries are used in some styles of beer, particularly framboise (made with raspberry) and other fruit lambics. Currants, raisins and sultanas are examples of dried grape berries, and many other commercially important berries are available in dried form. Berries are perishable fruits with a short shelf life, and are often preserved by drying, freezing, pickling or making fruit preserves. Berries such as blackberry, blueberry, boysenberry, lingonberry, loganberry, raspberry, and strawberry are often used in jams and jellies. In the United States, Native Americans were "the first to make preserves from blueberries". Chefs have created quick pickled soft fruit, such as blackberries, strawberries, and blueberries. Strawberries can be battered and quickly fried in a deep fryer. Sauces made from berries, such as cranberry sauce, can be frozen until hard, battered, and deep fried. Cranberry sauce is a traditional food item for Thanksgiving, and similar sauces can be made from many other berries such as blueberries, raspberries, blackberries, and huckleberries. Berries have been used in some cultures for dyeing. Many berries contain juices that can easily stain, affording use as a natural dye. For example, blackberries are useful for making dyes, especially when ripe berries can easily release juice to produce a colorfast effect. Rubus berries, such as blackberry, raspberry, black raspberry, dewberry, loganberry, and thimbleberry all produce dye colors. These were once used by Native Americans. In Hawaii, the native raspberry called 'akala' was used to dye tapa cloth with lavender and pink hues, whereas berries from the dianella lily were used for blue coloration, and berries from the black nightshade were used to produce green coloration. In Swaziland, several berry species are used as a dye. ^ a b c "Berry (Plant reproductive body)". Encyclopædia Britannica. Retrieved 16 August 2015. ^ "soft fruit". Collins English Dictionary – Complete & Unabridged 10th Edition. HarperCollins. Retrieved 11 August 2015. ^ "Soft Fruit List: 2014–15". Royal Horticultural Society. Archived from the original on 11 August 2015. Retrieved 11 August 2015. ^ "Berry". The Free Dictionary. Retrieved 10 August 2015. ^ "Elderberry (Sambucus Species)". The Poison Plant Patch. Nova Scotia Museum. Retrieved 13 August 2015. ^ a b Kenneth F. Kiple, ed. (2000). The Cambridge World History of Food, Volume 2. Cambridge University Press. pp. 1731–1732. ISBN 978-0521402156. ^ Jack Staub (2008). 75 Remarkable Fruits for Your Garden. Gibbs Smith. p. 213. ASIN B001PGX05K. ISBN 9781423608813. ^ a b c Chittaranjan Kole, ed. (2011). Wild Crop Relatives: Genomic and Breeding Resources: Temperate Fruits. Springer. pp. 22–23. ASIN B008CN2MQC. ISBN 9783642160578. ^ Vern Grubinger. "History of the Strawberry". University of Vermont. ^ a b George M. Darrow (1966). The strawberry; history, breeding, and physiology (PDF). New York Holt Rinehart and Winston. pp. 38–43. ^ George M. Darrow (1966). The strawberry; history, breeding, and physiology (PDF). New York Holt Rinehart and Winston. pp. 73–83. ^ Kiger, Robert W. & Porter, Duncan M. (2001). "Find term 'berry'". Categorical Glossary for the Flora of North America Project. Retrieved 14 August 2015. ^ "Banana from Fruits of Warm Climates by Julia Morton". Purdue University. Archived from the original on 15 April 2009. Retrieved 16 April 2009. ^ Shilling, Jane (20 August 2014). "Why these bitter berries are summer's sweetest fruit: Mixed bag of weather results in an early burst of the sloe". MailOnline. Retrieved 15 August 2015. ^ "Blueberries – Celebrating 100 Years". Blueberry Council. Retrieved 11 August 2015. ^ Russell, Betsy Z. "Wild huckleberry nearly tamed". idahoptv. Retrieved 11 August 2015. ^ Pittaway, Jenna. "Dr Barney Interview on the Western Huckleberry". wildhuckleberry. Retrieved 11 August 2015. ^ a b Yanyun Zhao (6 June 2007). Berry Fruit: Value-Added Products for Health Promotion. CRC Press. ISBN 978-1-4200-0614-8. ^ a b c d e f Pritts, Dr. Marvin. "Site and Soil requirements for small fruit crops" (PDF). Cornell Fruit. Retrieved 11 August 2015. ^ Handley, David T. "Growing Strawberries". University of Maine Extension. Retrieved 13 August 2015. ^ "Growing Strawberries". University of Illinois Extension. Retrieved 13 August 2015. ^ Whiting, David. "Growing Strawberries in Colorado Gardens". Colorado State University Extension. Archived from the original on 21 August 2015. ^ Gao, Gary. "Strawberries are an Excellent Fruit for the Home Garden". Ohio State University Extension. Retrieved 13 August 2015. ^ Kluepfel, Marjan; Polomski, Bob. "Growing Strawberries". Clemson Cooperative Extension. Retrieved 13 August 2015. ^ "Strawberry Production Systems". Maine Organic Farmers and Gardners Association. Archived from the original on 6 September 2015. Retrieved 13 August 2015. ^ Ruttan, Denise. "Plant strawberries and boost your health". Oregon State University Extension Service. Retrieved 13 August 2015. ^ a b c d Pritts, Dr. Marvin. "Key Features of Organic Berry Crop Production" (PDF). Cornell Fruit. Retrieved 11 August 2015. ^ a b c d e f DeEll, Dr. Jennifer. "Postharvest Handling and Storage of Berries". omafra. Retrieved 12 August 2015. ^ a b Kevin M. Folta; Chittaranjan Kole (16 May 2011). Genetics, Genomics and Breeding of Berries. CRC Press. ISBN 978-1-4398-5660-4. ^ Whitlow, Dr. Thomas. "Beach Plum". Cornell. Retrieved 13 August 2015. ^ "Edible Berries of the Pacific Northwest". Northern Bushcraft. Retrieved 13 August 2015. ^ a b "Berrypickers, unite!". The Economist. ISSN 0013-0613. Retrieved 12 August 2015. ^ Teivainen, Aleksi. "Record number of Thai berry pickers to arrive in Finland". helsinkitimes.fi. Retrieved 12 August 2015. ^ a b c Lee, David (2010). Nature's Palette: The Science of Plant Color. University of Chicago Press. pp. 58–9. ISBN 978-0226471051. ^ Wrolstad, Ronald E. (2001). "The Possible Health Benefits of Anthocyanin Pigments and Polyphenolics". Linus Pauling Institute, Oregon State University, Corvallis. Archived from the original on 7 July 2014. Retrieved 7 July 2014. ^ González CV, et al. (2015). "Fruit-localized photoreceptors increase phenolic compounds in berry skins of field-grown Vitis vinifera L. cv. Malbec". Phytochemistry. 110: 46–57. doi:10.1016/j.phytochem.2014.11.018. PMID 25514818. ^ Wu X, Beecher GR, Holden JM, Haytowitz DB, Gebhardt SE, Prior RL (June 2004). "Lipophilic and hydrophilic antioxidant capacities of common foods in the United States". Journal of Agricultural and Food Chemistry. 52 (12): 4026–37. doi:10.1021/jf049696w. PMID 15186133. ^ "Flavonoids". Micronutrient Information Center. Linus Pauling Institute, Oregon State University, Corvallis. 2016. Retrieved 2 November 2016. ^ a b "60 Berry desserts". Martha Stewart. Retrieved 13 August 2015. ^ "Baking with Blueberries". U.S Highbush Blueberry Council. Retrieved 13 August 2015. ^ Gordon, Megan. "Frozen Berries In Off-Season Baking: Should You Thaw Before Using?". The Kitchn. Retrieved 13 August 2015. ^ "Fresh Fruit vs Frozen Fruit in baking recipes". Baking Bites. Retrieved 13 August 2015. ^ Geisler, Malinda. "Cranberries Profile". AgMRC. Retrieved 13 August 2015. ^ Beck, Margery A. "Aronia berry gaining market foothold in U.S." USA Today. Retrieved 13 August 2015. ^ "Fruit Juices". Agriculture and Agri-Food Canada. Retrieved 13 August 2015. ^ Wright, John. "How to make Blackberry Wine and Whisky". The Guardian. Retrieved 13 August 2015. ^ Kime, Robert. "Strawberry Wine" (PDF). Berry Resources Cornell. Retrieved 13 August 2015. ^ "Bring on the Blueberry Wine". Wine Mag. Retrieved 13 August 2015. ^ Rudebeck, Clare. "A berry nice vintage: It's time to rediscover the ancient art of fermenting fruit wines". .independent.co.uk. Retrieved 13 August 2015. ^ The Jam Book. Taylor & Francis. 2014. p. 121. ISBN 978-1-317-84605-5. ^ Grotto, D. (2007). 101 Foods That Could Save Your Life. Random House Publishing Group. p. 53. ISBN 978-0-553-90451-2. ^ Satterfield, Steven. "Spiced and Pickled Blackberries". Food and Wine. Retrieved 11 August 2015. ^ O'Brady, Tara. "Pickled Strawberry Preserves". david lebovitz. Retrieved 11 August 2015. ^ Kord, Tyler. "Pickled Blueberries". Saveur. Retrieved 11 August 2015. ^ "Deep Fried Strawberries". Driscolls. Retrieved 31 August 2015. ^ Fortune, Fia. "Deep-Fried Cheesecake-Stuffed Strawberries". Forkable. Retrieved 31 August 2015. ^ Deen, Paula. "Cranberry Sauce fritters recipe". Foodnetwork.com. Retrieved 31 August 2015. ^ Deen, Paula. "Leopold's Huckleberry Sauce". Food Network.com. Retrieved 31 August 2015. ^ Currah, Allice. "Simple Homemade Blackberry Sauce". PBS.org. Retrieved 31 August 2015. ^ Lagasse, Emeril. "Raspberry Sauce". Food Network.com. Archived from the original on 20 August 2015. Retrieved 31 August 2015. ^ "Perfect Cranberry Sauce". Food Network.com. Retrieved 31 August 2015. ^ Garten, Ina. "Baked Blintzes with Fresh Blueberry Sauce". Food Network.com. Retrieved 31 August 2015. ^ "Dyeing with blackberries". Archived from the original on 3 August 2015. Retrieved 12 August 2015. ^ "Culturally and Economically Important Nontimber Forest Products of Northern Maine: Blueberry". US Forest Service. Retrieved 12 August 2015. ^ a b "Native Plant Dyes". US Forest Service. Retrieved 12 August 2015. ^ Mahady, G.B. ; Fong, H.H.S. ; Farnsworth, N.R. (2001). Botanical Dietary Supplements:. Taylor & Francis. p. 47. ISBN 978-90-265-1855-3. ^ Krohn-Ching, V. (1980). Hawaii Dye Plants and Dye Recipes. University Press of Hawaii. p. 13. ISBN 978-0-8248-0698-9. ^ Shujaa, M.J.; Shujaa, K.J. (2015). The SAGE Encyclopedia of African Cultural Heritage in North America. SAGE Publications. p. 382. ISBN 978-1-4833-4638-0. Look up berry in Wiktionary, the free dictionary.